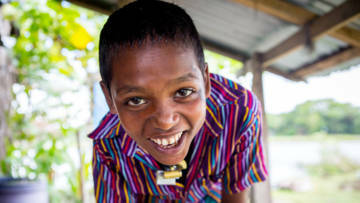 Watch Rabiul's story and find out how you can get involved in the give it up challenge, and help more communities like Rabiul’s. New Lent 2019 resources for primary schools. Inspire your pupils to learn, pray and give it up with our free Lent resources featuring Rabiul's family in Bangladesh. Lent ideas and activities for primary schools. Use our Lent PowerPoint assembly and script. Resources and prayers for Lent for Catholic schools. Fundraising ideas and resources to help you this Lent. Use this template to inform local press about your amazing Lent activities! Simple, daily ideas to give, act and pray throughout Lent and help take the give it up challenge. Slides to accompany the Lent 2019 assembly for children. Get involved in the give it up challenge and watch your giving help those in need around the world. Kick off your Lent activities and get involved with the give it up challenge with this assembly for children. You can use this text in newsletters when sending collection boxes or envelopes home with pupils. Give up your favourite app this Lent and raise money to help people living in poverty overseas. Printable photo booth props for give it up Lent 2019. 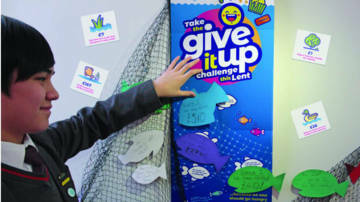 Download our Lent poster for children and join the give it up challenge. A PowerPoint of Lenten images and prayers for children. Celebrate Lent with this liturgy for primary schools. Use on Ash Wednesday or at another time to mark the season of Lent. Your guide to how to get involved in the Give it up challenge this Lent. Speak up for CAFOD – use our resources to help children share the Hungry for change message and practice their public speaking skills. Order more posters and stickers for your fundraiser.